For most British readers, the phrase ‘children during the war' conjures up images of the evacuees of the Second World War. Somehow, surprisingly, the children of the Great War have been largely and unjustifiably overlooked. 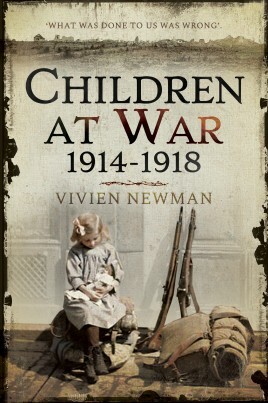 However, this book takes readers to the heart of the Children's War 1914-1918. For most British readers, the phrase ‘children during the war’ conjures up images of the evacuees of the Second World War. Somehow, surprisingly, the children of the Great War have been largely and unjustifiably overlooked. However, this book takes readers to the heart of the Children’s War 1914-1918. The age range covered, from birth to 17 years, as well as the richness of children’s own writings and the breadth of English, French and German primary and secondary sources, allows readers to experience wartime childhood and adolescence from multiple, multi-national standpoints. These include: British infants in the nursery; German children at school; French and Belgian youngsters living with the enemy in their occupied homelands; Australian girls and boys knitting socks for General Birdwood, (Commander-in-Chief of the Australian Imperial Force); Girl Guides working for MI5; youthful Ukrainian/Canadians wrongfully interned; German children held as Prisoners of War in Siberia; teenage deckhands on the Lusitania, not to mention the rebellious underage Cossack girl who served throughout the war on the Eastern Front, as well as the youngest living recipient of the VC. At times humorous, at others terrifying, this book totally alters perceptions of what it was like to be young in the First World War. Readers will marvel at children’s courage, ingenuity, patriotism and pacifism and wholeheartedly agree with the child who stated, ‘What was done to us was wrong'. Dr Vivien Newman is a respected expert on women in the First World War, with a particular interest in uncovering the lives of women overlooked by other historians. She is on the judging panel for the annual war poetry competitions organised by Never Such Innocence and has previously published four titles with Pen & Sword.